I've said it before and I'll say it again, young adult books aren't just for young adults. 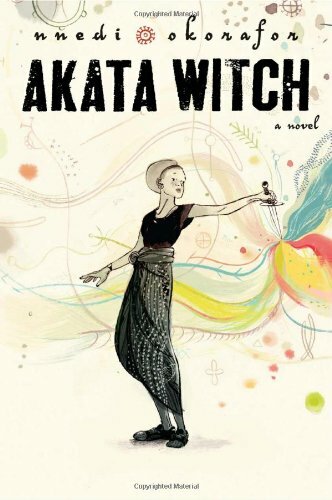 Akata Witch is a perfect example of a title that's cataloged in the YA section but has broad appeal. Sunny Nwazue is a pretty normal girl living in Nigeria. At least she feels pretty normal. There are certain things, though, that make her stick out. First of all, she's albino, and her pale skin and light-colored hair attract attention. Secondly, she was born in America and only recently moved back to her parents' homeland, and her accent betrays the truth of her origins. And if that weren't enough, Sunny finds out as a teenager that she has latent magical powers, and with those powers comes the responsibility to protect others from evil forces. Don't tell me you're not fascinated by a hook like that! Akata Witch delivers plenty of action and suspense, with refreshingly little romantic hand-wringing that poisons other YA fantasy novels I could name. Sunny teams up with a group of other magically-inclined teens, and together they learn to harness their powers. They'll have to learn fast—there's a murderer on the loose, a man who is kidnapping children for ritual killings, and Sunny and her friends may be the last and best hope for defeating him. I absolutely loved Sunny. She made my inner feminist go wild. She has all the insecurities one would expect of a teenage girl, but she triumphs over them in a meaningful way. At one point, Sunny realizes she's being belittled not just for being a girl, but for being an ugly girl, and for a moment she feels the weight of that judgment. (What woman hasn't felt that way before? If you have the audacity to be an outspoken, strong woman, you'd better also be pleasant to look at, or what's the point of your existence?) In a lesser novel, Sunny might overcome her sadness at being teased by meeting a boy who sees her as beautiful. Instead, thrillingly, Sunny trumps her tormentors herself and in the end, her looks forgotten, is celebrated for her abilities. Nobody has to tell Sunny she's beautiful, because looks aren't really that important when you're fighting evil juju. Nnedi Okorafor has several other YA titles already in print, as well as a book for adults. I can't wait to check out more of her work.